Adult fun in the sun Maui Snow White Russian Ice Cream is an ice cream combines the flavors of Pau Maui Vodka with Vapor Distillery’s Corretto Liqueur to make this White Russian inspired frozen treat. A recipe from Seduction in the Kitchen. This weekend has been beautiful with this sun shining and the warm weather. It is time to get out the ice cream maker. Winter is officially over! Over the winter I did do a recipe series called “How To Have A Girl’s Night In.” It was all recipes that use various types of alcohol from drinks to food. Well, that series was a huge success for me. Plus it gave you an opportunity to hear about some alcohol companies you may not have heard about. I decided I need a summer series, so the these for this new series is called: “Adult Summer Fun In The Sun” It will be all recipes that are for the adults because I am going to utilize those alcoholic beverages to create new drinks and frozen treats! This will be the first recipe in this series because, well it was the inspiration to do a series like this. A long time ago Ben and Jerry’s had an ice cream flavor called White Russian. I really liked it, but it did have a tiny amount of alcohol in it, so they had to retire what was a popular flavor. I was 16 at the time, I didn’t know it had alcohol in it, I just knew it tasted good. Well, since been so nice out, I have been wanting to make ice cream. Looking over at my bar table, I saw 2 bottles sitting together, Vapor Distillery’s Corretto Coffee Liqueur and Pau Maui Vodka. So I went about using these 2 flavors to create this creamy ice cream recipe. *What makes this recipe so good is these two Liqueurs. 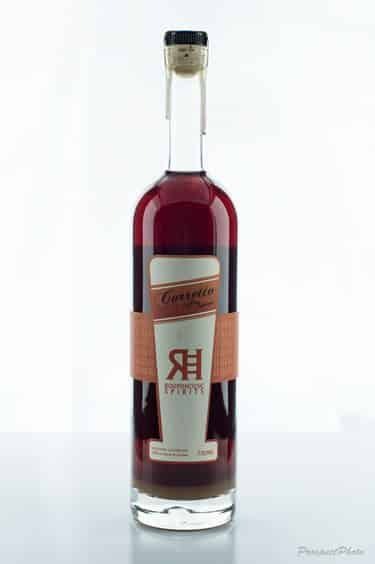 The Vapor Distillery’s Corretto Coffee Liqueur is a coffee liqueur like no other. In Italy, a “caffecorretto” is a coffee “corrected” with a shot of liquor. Vapor Distillery Corretto is a coffee liqueur that needs no correction, though. It is handcraft Corretto in small batches using organic free-trade beans that are hand selected by blind roaster, Gerry Leary, of the Unseen Bean in Boulder. Then a touch of whole vanilla bean, and sweeten it with just the right amount. The end result is a wonderful burst of coffee flavors spiked in the Italian-style. The other big-brand stuff is made with corn syrup and has a whopping 91 calories per ounce while Corretto comes in at a svelte 53 calories. *Pau Maui Hawaiin Vodka is the perfect vodka to go with the Corretto. Pau Maui is the only ultra-premium vodka crafted from Hawaiian pineapples. While there is no hint of pineapple flavor in the finished product, the Maui Golden ® pineapple provides a nice, clean mash to start from. Once distilled, it is mixed with crystal clear Hawaiian spring water. They take great care in what goes into their vodka – and more importantly, what does not. Handcrafted in small batches by Haliimaile Distilling Company, Pau Maui vodka is the essence of purity and cleanliness. Every ingredient that goes into the vodka is born on the islands, and the utmost in care is taken to ensure purity at every stage of the process. Adult fun in the sun Maui Snow White Russian Ice Cream is an ice cream combines the flavors of Pau Maui Vodka with Vapor Distillery's Corretto Liqueur to make this White Russian inspired frozen treat. A recipe from Seduction in the Kitchen. This weekend has been beautiful with this sun shining and the warm weather. It is time to get out the ice cream maker. Winter is officially over! Over the winter I did do a recipe series called "How To Have A Girl's Night In." It was all recipes that use various types of alcohol from drinks to food. Well, that series was a huge success for me. Plus it gave you an opportunity to hear about some alcohol companies you may not have heard about. I decided I need a summer series, so the these for this new series is called: "Adult Summer Fun In The Sun" It will be all recipes that are for the adults because I am going to utilize those alcoholic beverages to create new drinks and frozen treats! This will be the first recipe in this series because, well it was the inspiration to do a series like this. A long time ago Ben and Jerry's had an ice cream flavor called White Russian. I really liked it, but it did have a tiny amount of alcohol in it, so they had to retire what was a popular flavor. I was 16 at the time, I didn't know it had alcohol in it, I just knew it tasted good. Well, since been so nice out, I have been wanting to make ice cream. Looking over at my bar table, I saw 2 bottles sitting together, Vapor Distillery's Corretto Coffee Liqueur and Pau Maui Vodka. So I went about using these 2 flavors to create this creamy ice cream recipe. *What makes this recipe so good is these two Liqueurs. The Vapor Distillery's Corretto Coffee Liqueur is a coffee liqueur like no other. In Italy, a “caffecorretto” is a coffee “corrected” with a shot of liquor. Vapor Distillery Corretto is a coffee liqueur that needs no correction, though. It is handcraft Corretto in small batches using organic free-trade beans that are hand selected by blind roaster, Gerry Leary, of the Unseen Bean in Boulder. Then a touch of whole vanilla bean, and sweeten it with just the right amount. The end result is a wonderful burst of coffee flavors spiked in the Italian-style. The other big-brand stuff is made with corn syrup and has a whopping 91 calories per ounce while Corretto comes in at a svelte 53 calories. *Pau Maui Hawaiin Vodka is the perfect vodka to go with the Corretto. Pau Maui is the only ultra-premium vodka crafted from Hawaiian pineapples. While there is no hint of pineapple flavor in the finished product, the Maui Golden ® pineapple provides a nice, clean mash to start from. Once distilled, it is mixed with crystal clear Hawaiian spring water. They take great care in what goes into their vodka – and more importantly, what does not. Handcrafted in small batches by Haliimaile Distilling Company, Pau Maui vodka is the essence of purity and cleanliness. Every ingredient that goes into the vodka is born on the islands, and the utmost in care is taken to ensure purity at every stage of the process. (*Descriptions come from the websites of the products) Adult Fun In The Sun: Maui Snow White Russian Ice Cream Adult fun in the sun Maui Snow White Russian Ice Cream is an ice cream combines the flavors of Pau Maui Vodka with Vapor Distillery's Corretto Liqueur to make this White Russian inspired frozen treat. 1 cup whole milk1 cup half and half1 cup heavy cream3/4 cup sugar2 tablespoons Pau Maui Hawaiin Vodka2 tablespoons Roundhouse Corretto Coffee Liqueur Making ice cream does take a long time to create. First you have to make a base, so in a pot, add the milk products and the sugar, stir them together and heat the milk to 170F degrees. Take off the heat and let cool off in the fridge over night. Once the base has cooled off, usually about 40F degrees, add the liqueurs. Add everything to your ice cream maker and start mixing it together. Follow the manufacturer’s instructions on mixing it up. Mine makes ice cream in about 2 hours. When it done, scoop it out and ENJOY! Making ice cream does take a long time to create. First you have to make a base, so in a pot, add the milk products and the sugar, stir them together and heat the milk to 170F degrees. Take off the heat and let cool off in the fridge over night. Once the base has cooled off, usually about 40F degrees, add the liqueurs. Add everything to your ice cream maker and start mixing it together. Follow the manufacturer’s instructions on mixing it up. Mine makes ice cream in about 2 hours. When it done, scoop it out and ENJOY! It is so good, and soooo addicting! LOL! Sometimes simple is better 🙂 Thank you! Thank you! Thank you for having me!